When you have plantar fasciitis, you often have to find special shoes that are going to provide you with the support that you need to alleviate the pain. You may try on some regular shoes, but after a short time, the pain will be too much to handle. There are many types of shoes that you can go with to help out with this foot problem, but most of them look bulky and aren’t as appealing as your typical shoes. This can be especially hard if you are dealing with dress shoes for the workplace or for a special occasion. Thanks to some of the shoes and brands listed below, you will be able to find the exact shoe that you are looking for in no time. These shoes are attractive and look amazing and no one will be able to tell that you are wearing a shoe with added support and comfort. You will love that you can wear attractive shoes without all the pains again. So when you need a new pair of shoes that helps with your plantar fasciitis, check out some of these fantastic options below. Finding an attractive women’s dress show when you have plantar fasciitis can seem impossible. Many women assume they need to wear flat shoes or get ones with orthotics that are uncomfortable and don’t look good with their dress outfits. These dress shoes from Naot will fit the bill for providing the right support to your foot while still looking amazing. These shoes are made from real leather, have a rubber sole, and the heel is 2 inches. You can pick from black or quartz, or get one of each to match all your dressy outfits. Enjoy an extra buckle around the ankle for some style and support all in one. While they may not be the highest trend in fashion, they will look amazing and help keep your feet comfortable. Some women are not the fondest of the style of these shoes. While they do have some of the features of your other dress shoes, there are a few things lacking and often these will appear bulky compared to your other dress shoes. You may want to try these on first to see if they are going to fit into your wardrobe or if they will look a bit off. You will enjoy the comfort and all the support with these shoes and many people love the look and feel of them, so it is worth giving them a try. 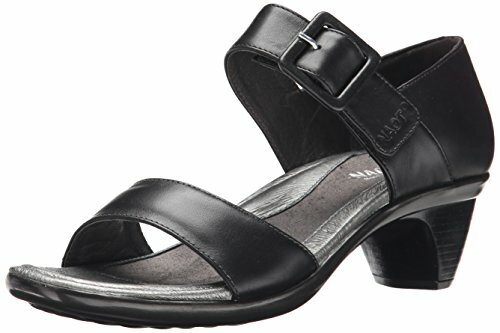 If you love the look of regular heels but they really hurt your feet, this option from Naot is a great option. It can provide you with that heel look, but you will feel just like you are wearing a flatter shoe. The construction is hand sewn and it is strong and flexible, making it perfect for all your needs. It comes 8 different colors so you can choose the one that works the bet for the occasion. For all the support and comfort you will get out of these shoes, they are available for a great price and it is a great idea to keep an extra pair in your closet. This shoe from Naot is one of the best on the market for dealing with your plantar fasciitis. Many who deal with this condition are not able to wear high heels because of the lack of support and how it can mess with the curvature of their foot. But with this option, you will be able to get the stunning look of a heel, while feeling that you are wearing a flat heel. It is the best of both worlds being able to get the look you want as well as the comfort that is much better on your feet. Even sandals can be comfortable when you go with the Sanita brand. These are durable and strong so you can wear them either for a special occasion or for a day on the beach. The come with a strap around the ankle and one around the toes so you can get that extra support and comfort that you need. The design is also very open so your toes and most of your foot can get some time in the sun. These do some with a heel, so they are easy to throw on with a beautiful beach dress and really show off your style. Pick from one of six styles to match any occasion or wardrobe choice. If you feel that the heel is a bit too much for your foot, you may want to go with another option. While this adds a bit of elegance to the whole affair, it is sometimes uncomfortable to have a heel that high, especially if you want to have a pair of sandals to wear at the beach. But if you don’t mind having that extra heel and adding a bit more style to your wardrobe, the high quality materials, the great little designs, and so much more will help you to fall in love with these sandals. Looking for a comfortable wedge that provides all the support that you need and still looks amazing? This option from Vionic with fit the bill. Not only do they feel comfortable, but these are high quality shoes that include leather, suede, snake print, and so much more. One of the things you will love the most about these shoes is that they are very budget friendly, despite the high quality material placed in them and all the designs that you can choose from. Enjoy the rubber sole, the extra support where you need it and a heel over 2 inches high! This shoe from Cobb Hill is the best of both worlds. It provides the comfort of a flat with some of the style of a little bit of heel. And with three great colors to choose from, you may find it is difficult to know which one will look best each day. These shoes are made from leather and you will be able to sink your foot into the memory foam foot bed that is perfect for dealing with your plantar fasciitis. When choosing this shoe from Cobb Hill, you will find that it is able to help improve your posture while also dealing with the plantar fasciitis so you can get comfort, even if you have to wear the shoe all day long. These shoes do run a little bit small so keep that in mind when comparing to the size you purchase in other similar shoes. Heels are not something that every person likes, but that doesn’t mean that you have to give up on having a great dress shoe that fits perfect and looks amazing. 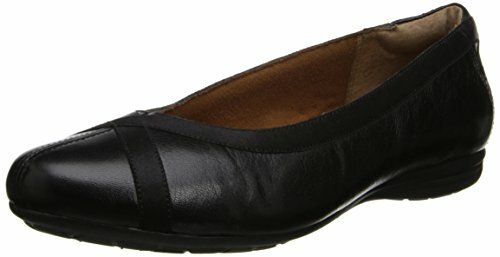 This loafer from Vionic will prove just that. It comes in 11 different styles and colors so you will be able to mix and match based on the outfit that you need to wear or the one that fits your style. They are all made of leather with a rubber sole and outsole, and the biochemical orthotic foot bed is something you will fall in love with. Even though these shoes are made from really high quality materials and have the added orthotic that helps to keep your feet supported all day long, you aren’t going to have to spend much more than on a regular dress shoe. This makes them budget friendly and perfect for everyone. Simple and elegant is the best way to describe this shoe. It is great for dainty little fit that want to be comfortable all day long, but can easily fit into a casual dress attire at the work place. Once you are done, switch into something even fancier and wear these shoes out on the town. Despite how simplistic they are, the little embellishments on the front and the nice leather exterior allow these shoes to work for pretty much any occasion. Choose from black, tan, or a fun light blue to make your wardrobe complete. These shoes usually run a bit large so you may want to go down a size when making the purchase. Are you a fan of the classic wedge look but had to give this all up because of how uncomfortable they make your feet feel with the plantar fasciitis? 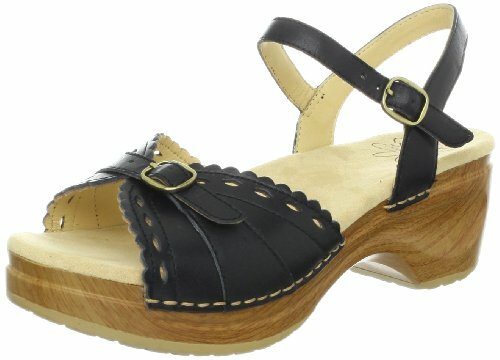 Look no further than these classic wedges from Vionic. Not only can you get the great style that you want, but these particular brand of wedges have all the support you need to keep the feet comfortable and happy, even if you need to wear the shoes all day long. Between the red, black, and dark brown, you are sure to find a color that you like and the orthotic foot bed with the great orthaheel technology that you can only get from Vionic will ensure that you are not causing any damage to your feet. Use the measuring tools available from Vionic before purchasing to ensure you are getting a shoe that fits your feet perfectly. Even men can be stylish when they pick out the right pair of dress shoes. Just because you are suffering from plantar fasciitis does not mean you have to go around wearing ugly shoes that don’t match with your outfit and make you look bad at work. 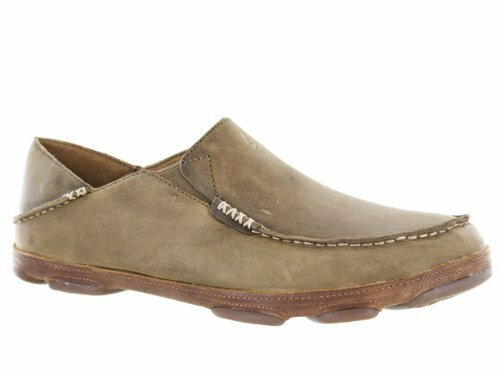 With the OluKai Moloa Shoe, you can choose from many different options, 22 to be exact with this style, so you are going to find the one that meets your needs. There is so much you will love with this particular shoe. First, the upper part is hand sewn with a moccasin stitching, the food bed comes with a contoured foot bed to make your feet happy all day long. You can also choose to drop in a heel to make the fit perfect or to add a bit of heel if you wish. 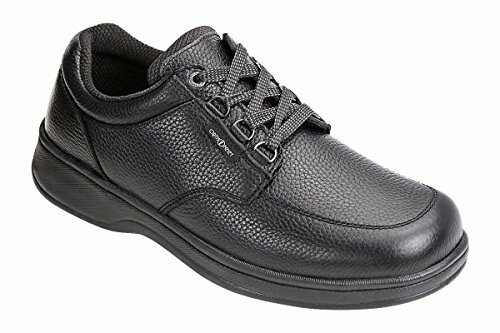 This is the perfect shoe for any man suffering from plantar fasciitis who is interested in feeling comfortable and looking great all day long. Many men want a classic look, a dress shoe that will look good with whatever they are able to wear for the day. They don’t want a lot of frills, but they want to look like they are put together and have people notice their stature. If this is the description of you, than these dress shoes from Vionic are the perfect choice. 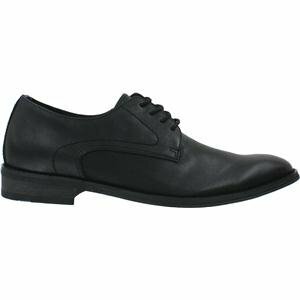 They are the nice simple black dress shoe that looks amazing no matter what you wear. But instead of having to worry about them being too uncomfortable or rubbing you in the wrong places, these ones are going to work with your plantar fasciitis to ensure that you get all the support you are looking for thanks to the Orthaheel technology. These shoes are going to look good, with the leather exterior and rubber sole, while also providing you with improvement in your alignment and relief from your knee pain, heel pain, and foot pain. Choose from either black or dark brown to complete your look. Are you a man who is on his feet all day, running from one department to another and never getting a break? Normal dress shoes are just not going to cut it for you if you are always on the run. They are too slippery, the material just doesn’t bend with you, and you are probably going to want to switch out of them into some running shoes in order to keep up. If this sounds like a typical day at work for you, you should consider these great dress shoes from Avery Island. These shoes combine the style and luxury of a dress shoe together with the comfort and ease of a tennis shoe. They are designed to be comfortable, unique, and work for all of your health issues including orthopedic, diabetic, therapeutic, and even for arthritis. They also come in wide sizes so they will fit on almost any foot that needs them. The easy gait feature makes the shoes comfortable and the cushioned sole is going to feel so good on your plantar fasciitis. Add in the orthotic support and how easy these shoes are going to fit on your foot, and you can easily wear them all day long while running around and still staying comfortable. When you are looking for a shoe that is unique, comfortable, provides you the support that you need for your posture and feet problems and fits into your budget, this is the shoe for you. Vionic is known for providing some of the best shoes on the market, and this is no exception. 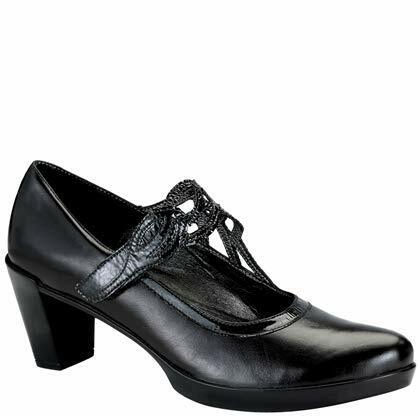 These shoes are made with leather and come with a small heel to add a bit more support to the foot. The moc-toe stitching makes it really unique and the rubber sole will help you to get the traction you need, whether you wear these in the office or when you are out and about. The laces on these shoes are a bit difficult to deal with for some people; these aren’t made of the same quality materials as the rest of the shoe so keep this in mind. In addition, you may notice that the fit is not true to size. Consider using the fitting tools for the product and seeing if you are able to find the right size for yourself the first time. 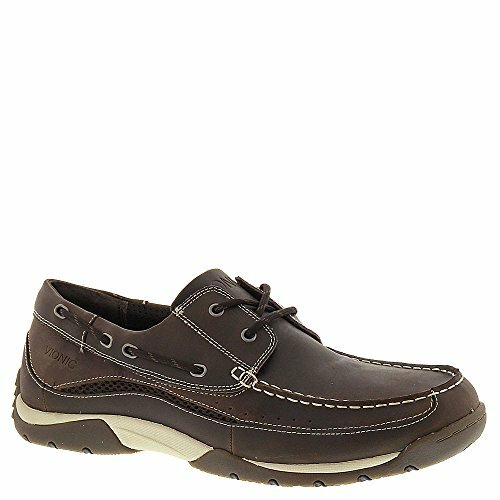 These shoes are a bit different compared to some of the others on the list, but for the budget friendly price and the comfort, you are not going to find a better shoe in town for making you feel great. These shoes are made from synthetic material with a canvas on the upper part, a zero drop heel lift, and an outsole that is non marking and non-slip so you will be comfortable no matter where these shoes will take you. While they may not be the fanciest of dress shoes on the market, they certainly bring in a lot of comfort and will work well for most business settings. Some customers found that these shoes did not come in the right size, and if you are someone with wide feet, this style may not be the one for you. 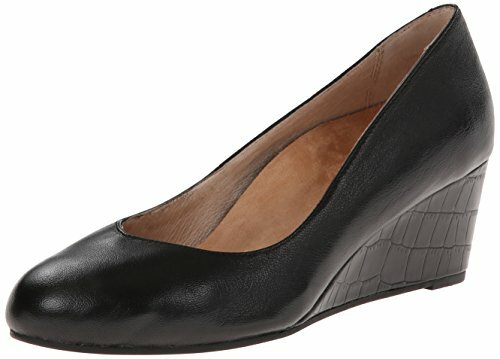 But if you need a great dress up shoe that works for business attire and will keep your feet comfortable all day long, these are the shoes for you. Picking shoes that are going to work great for your plantar fasciitis can seem impossible. You want to make sure that you look good and that no one notices the problem due to your shoes, but most shoes made for your issue are ugly and unattractive. When you are ready for something new that looks amazing, make sure to check out some of these fantastic shoes to make life so much better!